What happens if you need to run both online transaction processing (OLTP) and data mart workloads from the same storage environment—simultaneously? If you’re not sure of the answer, you’d better double-check that your storage array can keep these high-performing workloads up and moving. Here’s where all-flash enters the space. 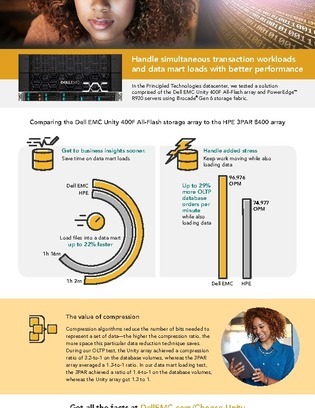 Download this infographic to see Dell EMC Unity 400F with Intel® Xeon® processor tested on these database-intensive tasks, in which you’ll learn how this all-flash array compares to another AFA top-dog in terms of data mart file loading, number of OLTP database orders per minute, and more.